Do you offer me appointments at convenient times and are you on time? We give you a dedicated appointment slot to minimise any waiting and will let you know if our dentist is running more than 5 minutes late. We can offer Saturday appointments with the hygienist or dentist, and we can offer you dental appointments from 8am and after 5pm. Do you want to be able to choose the treatments you want? Do you want to know what you will pay and when? We will give you a written treatment plan with the expected costs involved. Do you want a dentist you trust? All our dentists are registered with the GDC and attend regular courses to keep up to date. In one year our dentists spent over £17000 attending advanced cosmetic courses so they can offer you the best treatments. Our most experienced dentists have all passed postgraduate exams. For nearly 10 years the practice has been approved to train newly qualified dentists. Our practice has been established for over 10 years. In recent independent surveys we have achieved consistently successful results with in some cases 100% of our patients satisfied with their treatment. Most of our new patients are recommended and as we are a family practice we welcome children as well as adults. Do you want trained nurses helping your dentist and a regular dentist not new faces every time? All our team members are friendly and welcoming and our nurses are fully trained or registered with the GDC. We have actively avoided the need for temporary staff and the majority of our existing staff have been with us for several years. Our senior dentists have all been with us for a minimum of 5 years. Do you want a dental practice with a clean, modern environment? We have refurbished our practice and invested heavily in our equipment. We are fully computerised, have digital x rays including access to large full mouth x rays if needed. We have one of the latest vacuum autoclaves to sterilise instruments. Time is given to nurses to clean between patients and we use disposable equipment wherever possible. 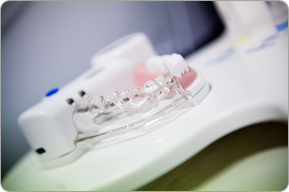 We can take photos of our work to show you the treatments we have carried out. What happens if you need an emergency treatment? We are usually open Mon to Fri from 9am until 5pm and also Saturday appointments and evening appointments are available. We can nearly always offer you a convenient appointment. In case of an out of hours emergency there will always be an emergency telephone number to contact on our answerphone. We have 5 dentists working so if your dentist is away on holiday, one of his colleagues should be available. Do you want to see the hygienist at an affordable price? Our hygienist works on Wednesdays and Saturdays. Her charges are from £44.50 for a half an hour appointment. She is very good at providing a comfortable but full clean and also has a nurse to assist her if needed. Her appointment includes a gum assessment, oral hygiene and diet advice, an extensive scale and polish/periodontal treatment and free oral hygiene samples. Children also benefit from hygiene sessions and can be seen from £25.